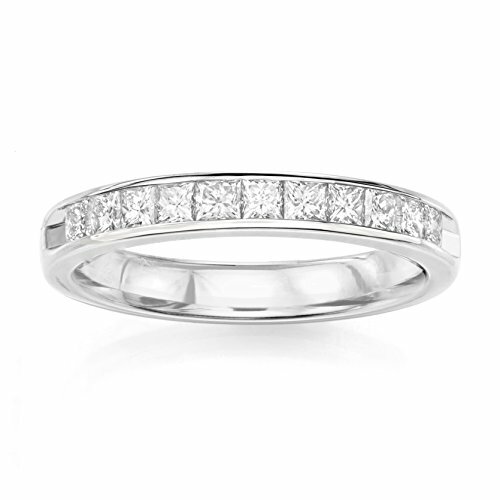 14KT White Gold 0.33ct Channel Machine Set Wedding Ring with G-I color and SI1/SI2 clarity diamonds. Very Good - Excellent cut, conflict-free, natural diamonds accurately graded and described as per GIA's strict grading standards. Our gold is responsibly sourced with the majority of it coming from recycled gold. Machine Set Bands are precision crafted by high-end CNC machines and not from traditional castings. This provides highest quality of fabrication possible. Satisfaction Guaranteed- If in the unlikely event you are not completely satisfied with your purchase return it within 30 days for a full refund. After 43+ years of selling diamonds and jewelry in the Manhattan NY Diamond District, Uncle Sam's Diamonds are now available on Amazon. You can expect the best values from our products and service that you would expect from Amazon directly. We promise you'll be satisfied AND save 30%-50% off retail. If you have any questions about this product by Uncle Sam's Collection, contact us by completing and submitting the form below. If you are looking for a specif part number, please include it with your message.